How much is your dealership wasting on replacement keys? Today’s feature-heavy vehicle keys mean higher prices for replacing lost keys. Your dealership is vulnerable because the vehicle keys are circulating every day. Key replacement costs eat directly into your bottom line. What if you had a fool-proof system for managing the keys? When a key is lost, can you prove who lost it and put the responsibility on them? Can switching from a pegboard or closet to an electronic key management system save a significant amount of money? The cost of a replacement key depends on the type of key. Add more for luxury vehicles. Dealerships often get a discount on replacement keys. However, dealership employees must spend time ordering the key, picking it up, following up, and arranging payment (Accounts Payable). This paid time may wipe out any discounts. Most dealerships keep the spare keys for the vehicles locked in a filing cabinet with the vehicles’ paperwork. New vehicles have a spare, but pre-owned vehicles might not. 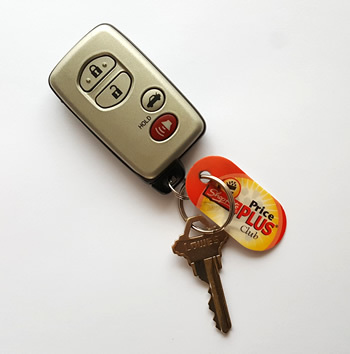 The vehicle key used for moving and demonstrating the vehicle is more at risk of getting lost. If this key goes missing, you can dig up the spare key. This will get you by until a replacement key can be made. With a pre-owned vehicle, you might be tempted to skip replacing the extra set of keys. Skipping it saves some money. The customer would have to deal with it. However, a certified pre-owned vehicle is usually required to include two sets of keys. Also, the extra set of keys increases customer satisfaction. Better to pay now than have an unhappy customer later. If you neglect to get an extra key, and the original key is lost, that vehicle is stuck-in-place until the new key arrives, you have it towed, or several personnel push it. THAT’S embarrassing! An electronic key management system reduces the number of lost keys at a dealership. Personnel know that if they take out a key, they are responsible. The KeyBank Auto system requires a User ID and PIN, or a fingerprint, before opening the door to the key cabinet. When the door is open, every key removed is assigned to that individual. A gentle chime reminds them to close the door. Personnel quickly learn that if the key isn’t returned, there will be a consequence. They quickly find ways to keep track of all their keys, and return them promptly. With the new system, keys rarely need to be replaced. Therefore, the dealership saves money. At Key Control Systems, we have calculated that a typical dealership can recoup the cost of a key management system in 2 to 4 years or less. Some dealerships elect to hold personnel financially responsible for key replacement costs. This shifts the costs away from the dealership’s bottom line. Note: Seek legal counsel before docking pay. The only way to prove who is responsible is by using an electronic key management system. If the key is signed out to someone, and it doesn’t get returned, that person is responsible. Personnel want to succeed, and they want the dealership to succeed. They become quickly attuned to the new system. When they learn that they will pay for replacement keys, returning keys becomes a top priority. Personnel make sure their keys get returned. Within a few weeks, responsible key management becomes a daily habit. The dealership has savings from two other areas when an electronic key management system is installed. Wasted time: No more wild scrambles to find keys. No more interruptions asking, “Where is the key to the . . .” No more waiting around to move a vehicle. Lost sales: Customers who want to demo a vehicle are unwilling to wait around. They see the dealership in an uproar because the key is missing! “I’ll come back later,” is a lost sale. Even a couple of lost sales a month hurts the bottom line and damages quotas. The high cost of key replacement means getting a electronic key management is a no-brainer. The system will quickly pay for itself. Dealership personnel will be at ease. And the dealership will have a fatter bottom line. Key Control Systems is happy to discuss a new key management system. Just fill in our contact form or give us a call at 888-685-1040.